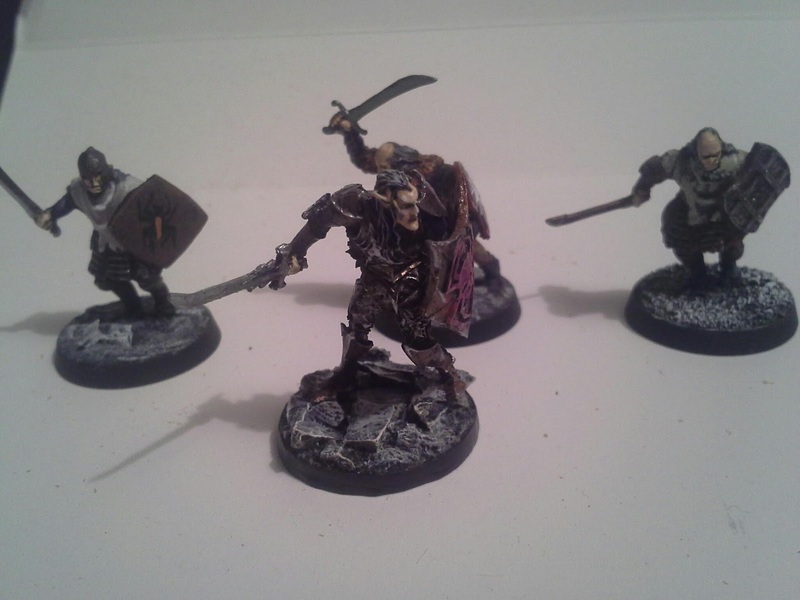 Ages ago i bought a box of the dungeons and dragons galeforce9 drow war party (at least i think thats what it was) from our local games store... i wanted a new Orc hero for my war of the ring orc army... so i made up and painted the knight as a Dol Gûldûr Orc commander... the rest just got thrown into the abyss of wargaming stuff in my garage. Then along came Frostgrave.. or i came across the game via jamies blog (Rough War) and thought to myself what a cool idea. What could be more fun than a few treasure hunters searching for new items whilst fighting off random creatures and an opposing wizard with his own crew of treasure hunters. The scope for this game seems endless as no official figures are required, all the stats are pretty much generic so you can field whatever warband you feel like. 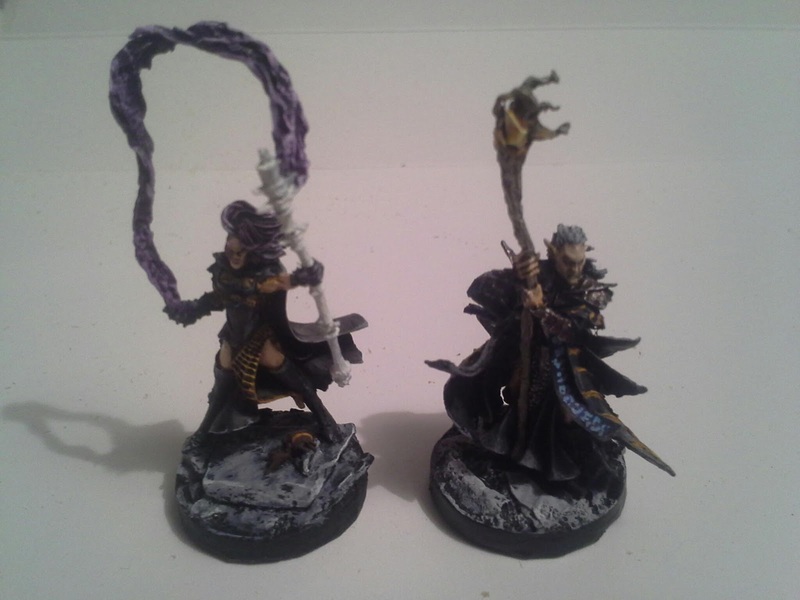 So i went searching in the abyss for a suitable wizard and some warband guys, iv got gandalf and kardush and a few lotr figures i could use, as well as an entire crusader army i could pilfer some figures from, but in my search i came across these forgotten about d&d guys and i got cracking and quickly put together a warband. Totally happy with it, only thing i didnt like was that the galeforce9 figures are made from resin... that breaks really easily :( already the rogues ponytail is snapped off along with some other small details. Great spults, high detail but that comes at a price ($ & breakages), so overall i wouldnt consider getting these type of figures ever again, as i prefer something that will last. Ive also got a knight and a couple of extra men at arms to expand the warband if i need to as campaigning continues. 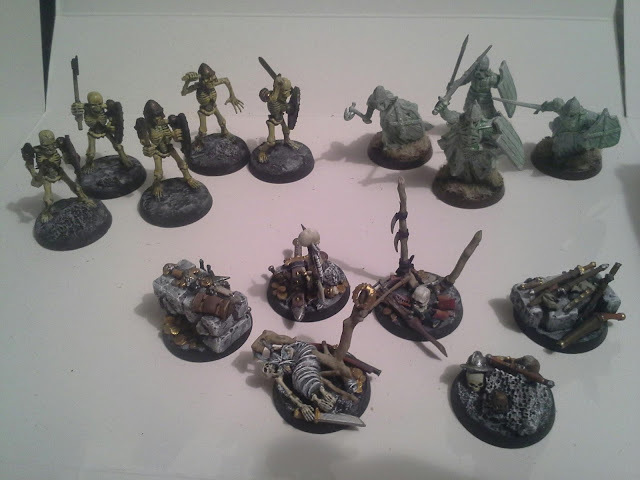 Skeletons were put together and painted super quick, dont look too close, they do the job for the scenarios. Treasure tokens were made from a heap of old bits (trying to keep with the spider theme). The only thing i have left to do is to put together a few more random encounter creatures and build the tower from the tower scenario, then im done... frostgrave is that easy. First battle with Jamie went well, i managed to bag a beserker with my mage and take off with 4 of the 6 treasure tokens with no losses. My marksman was a beast, he totally held the fort, even though he was unlucky to get no kills, he drew a heap of fire and got pretty lucky surviving it all, my dice rolling went amazing at times and i managed to get some crucial hits in. Thoroughly enjoyed the game. Hmmm... this looks interesting, I like the variation of models. 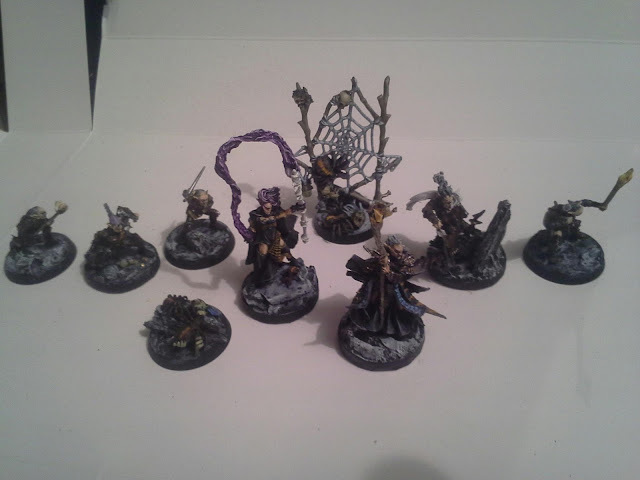 And not to mention the markers/objectives, very nicely done!